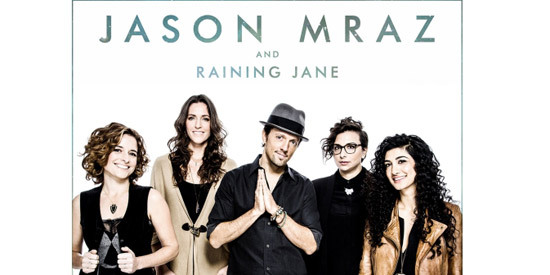 Jason Mraz and Raining Jane will perform live during their November 27 concert at the Smart Araneta Coliseum. Since launching his musical career 15 years ago by playing the local shops and coffee-house circuit in San Diego, California, Jason Mraz has brought his positive image and soulful, folk-pop sound to audiences worldwide through his recordings, sold-out live performances and philanthropic projects. On November 27, Mraz will perform once again for his Filipino fans at the Smart Araneta Coliseum. This time, he will be joined by Raining Jane, an all-female rock-folk band. MMI Live! and Ovation Productions have teamed up in bringing back the multi-Grammy Award-winning singer-songwriter to the concert scene one-and-a-half years after his last performance here on May 14, 2013 also at the Big Dome. This will mark his fourth appearance since his first visit in 2006 during a two-day promo tour. During the next few years, Mraz has earned multi-platinum certifications in more than 20 countries for his various releases, sold 48 million singles and made pop history with his record-shattering single, “I’m Yours.” Among the accolades he has received were two Grammy Awards (out of six nominations), a Hal David Starlight Award from the Songwriters’ Hall of Fame, and nominations from the Teen Circle Choice Award and People’s Choice Award. The 36-year-old American pop sensation has performed in major amphitheaters and arenas across the globe and sold out iconic venues, such as the Hollywood Bowl, Madison Square Garden and London’s 02 Arena. His latest recording achievement was the release on July 5, 2014 of YES!, his fifth and first-ever acoustic album which he wrote and recorded with the Los Angeles-based folk-rock band Raining Jane. Hailed by Billboard as “an invigorating change-up record that shines in an already impressive discography,” the new album made a smash debut at Number 1 in 46 countries, with its chart performance showing no signs of slowing down. Aside from being a singer and recording artist, Mraz is also known as a dedicated surfer, farmer-gardener, filmmaker and photographer. As a committed global citizen, he is deeply involved in various social activism and philanthropic efforts that include wide-ranging environmental advocacy and support for LGBT (Lesbian, Gay, Bisexual, Transgender) equality. He has participated in several global activism endeavors, such as a rescue mission to Ghana with Free The Slaves and an internationally broadcast performance in Myanmar with MTV Exit to promote awareness of human trafficking. In 2009, in recognition of his advocacy and support for a clean environment, sustainable energy, education and human equality, the Environmental Media gave Mraz the Missions in Music Award. He was also invited to join former US Vice President Al Gore in the Climate Reality Fact-Finding Expedition to Antarctica in January, 2012. With these activities, Jason Mraz hopes to continuously celebrate and acclaim music’s myriad forms and transforming power, inspiring and delighting countless fans all over the world which he calls home. Jason Mraz and Raining Jane Live In Manila! is promoted by Ovation Productions and MMI Live!